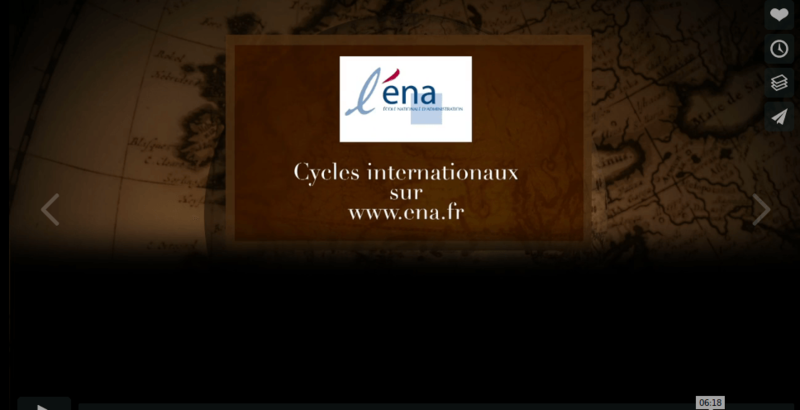 We announce the opening of the selection procedure for the long international cycles of the ENA and IRA 2019-2020.
aster’s degree programmes in “Communication of public institutions”, “Public action in Europe” and “General public administration” organised by ENA in partnership with CELSA, Paris 1 Panthéon-Sorbonne and the University of Strasbourg. – the ENA’s International Development Cycle (CIP) (duration: 8 months, for senior officials). This training is combined with two professional master’s degree programmes in “Public Administration and International Affairs” and “Specialised Public Administration” organised by the ENA in partnership with Paris 1 Panthéon-Sorbonne and the University of Strasbourg. – the International Cycle of IRAs (CiIRA) (duration: 8 months, for junior and senior officials). IRAs also offer the possibility for foreign officials to prepare a master’s degree, in parallel with their schooling. Online registration on the ENA website, from 24 September to 16 November 2018. Candidates must submit their complete application to the embassy which will carry out the pre-selection (see selection memo). However, an online registration procedure by a third party is possible for countries where a ministry or other coordinating authority centralizes applications. Timetable: for the 2018-2019 procedure, the timetable has been adapted in coordination with the Democratic Governance Mission of the Directorate General for Globalization and Partnerships. The calendar is detailed in the selection memento that you will find in PJ. Please find below the documents useful for the selection, in French and English.